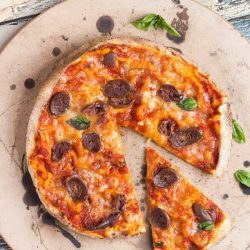 With a really simple flatbread pizza recipe, a frugal dinner is never far way. Keep a packet of flatbreads in the freezer, and dinner can be on the table in under 20 minutes. Line a baking tray with baking paper, and place the flatbread on the tray. Spread the pizza sauce over the flatbread. Scatter the grated cheese over the sauce. Add your desired toppings. Try not too add too many toppings as this will cause the pizza to go soggy. Place the baking tray in the oven, and cook for 8-10 minutes, or until the pizza is browned to your liking. Remove from the oven, cut into slices and enjoy! Nutrition information is provided for a basic Margherita pizza, using a commercial pizza sauce. Homemade sauce, and the addition of toppings will change the nutritional analysis.